When my father, Glenn Doman published his book, "How to Teach Your Baby How to Read" in 1964, it introduced to the parenting community a bold concept that tiny children can not only learn to read, but in fact love to do so. And so, with the use of this book, thousands of moms were able to teach their kids to read at a very young age. And while in the process of teaching their babies, these moms also discovered that: Their children were learning to speak at a faster, more accelerated rate than the usual. Babies are natural, fast learners. They learn to speak an entirely new language simply by being immersed in the speaking environment of that language. In time, as words and phrases are repeated often enough and loudly enough in meaningful situations, they become familiar and understood. While a baby's vocabulary grows through exposure to his language, daily conversation is somehow a haphazard method of teaching language, even though it works through sheer repetition. And this is exactly what these mothers discovered. When the mothers teach their babies how to read by presenting words loudly and clearly, the learning is reinforced simultaneously down two pathways - the visual and auditory pathways. When these words are presented two or three times on the same day for four or five days consecutively, language development accelerates because of the structured manner that is no longer random and left to chance. And because the brain is such a highly organized organ, this orderly approach allows language to be learned with great speed, efficiency and intimacy with the parent. As the reading program expands from words to phrases to sentences and to books, the baby's vocabulary also expands in both quantity and sophistication. Mothers regularly report that their children's spoken vocabulary has developed in direct relationship to their reading program. Teaching couplets, which are two word combination, encourages the tiny child to use couplets in expressing himself. Later, this same phenomenon occurs as the baby advances with phrases, sentences, and paragraphs. Once a baby has enjoyed many words, phrases, sentences, and books about his environment, Mother can enrich his vocabulary by teaching descriptive terms and adding more exotic information. Adding a personalized creative element allows the reading program to be fun and tailored to the baby's likes and interests. Adding more personal touches can be fun and exciting for both mother and baby. Homemade books illustrated with colorful drawings or photographs of actual experiences further clarify and strengthen the language. Mom's own creative imagination can add ideas for words and books about daily life. Or, one could use basic reference books such as the thesaurus to help expand a child's vocabulary. With this new information, an old homemade book can be revitalized by replacing the ordinary "Tony eats breakfast" with "Tony consumes breakfast" or "Tony ingests breakfast." Or, an entirely new book can be created for the specific purpose of using extraordinary language. In this way, a child's vocabulary expands, as does Mom's and Dad's! 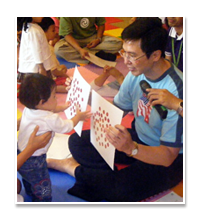 Ideally, every baby should have two reading programs, beginning at a very young age. One is created exclusively for him, using large print and a limited number of words on a page to promote independent reading. The other, just as valuable in developing both spoken and written language, is to read to him from the world's enormous library of adventure, drama, poetry, and prose. Poetry is particularly good to read to a child, as the language has been chosen especially for its beauty. There are many fine collections of poetry. Some are by individual poets, such as A Child's Garden of Verse by Robert Louis Stevenson. Others are collected anthologies of many poets, such as those edited by Louis Untermeyer. In addition, beautifully illustrated versions of Shakespeare's sonnets are eloquent treasures of the English language that a child will be sure to enjoy for many years. By regularly reading classical literature to a child, using selections beyond his own reading ability, a parent will stimulate his enjoyment, imagination, and understanding of the vast and beautiful language of his culture, both written and spoken. When choosing what to read to a child, it's a good idea to use guidelines such as reading several works by an individual author, several selections of a certain type of genre (fiction, poetry, short stories), classics written in a specific period of history, or literature from a specific part of the world. Hearing such sophisticated selections will enhance a child's independent reading while developing his language. Parents will discover that teaching a child to read and reading to a child is the most dynamic language program possible.